Yesterday, Facebook made an important change that might change the way users interact not only with each other, but with brands. 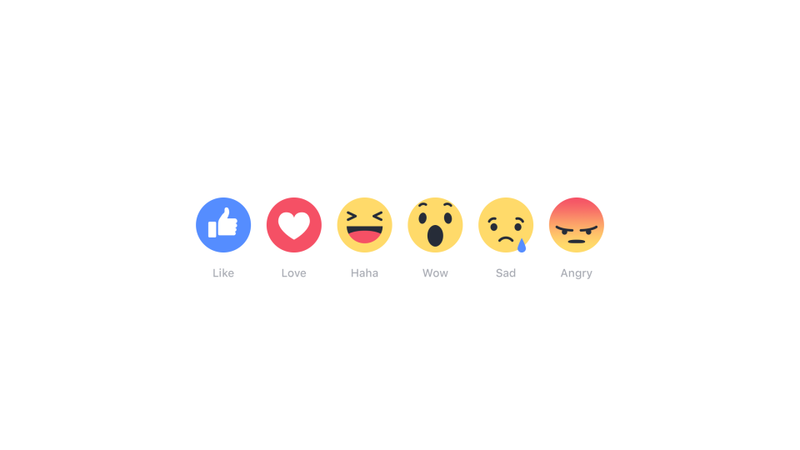 Rather than just the standard “Like” option to react to posts, users can now choose from a range of reactions by hovering over the like button to reveal the buttons and accompanying emojis for Love, Haha, Wow, Sad and Angry. 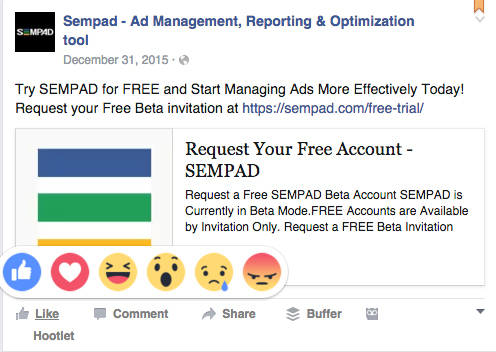 The platform has long been a collection of posts we respond to in more ways than one, so Facebook’s reaction buttons are something that gives users far more choices in terms of how they express themselves and how they really feel about a post. Posts with many likes tend to sit higher on most people’s timelines, and the same will apply with these newer responses, tailoring a viewing experience based on algorithms the same way as before. But what could this possible mean for brands using Facebook, and other social media platforms as a way to connect with their audience? Not every user leaves comments on Facebook, particularly on brand pages or communities they’re apart of. Liking and sharing are the go to actions and interactions when it comes to pages but this doesn’t always reveal just how the user felt about it. These buttons are a great way to get a more in depth idea about what posts are making the most impact. Getting this type of feedback could make it easier for brands to see the types of content their users simply “Like” vs. what they Love. It’s important to consider that everyone uses social media in different ways, and these newer reaction buttons give them the ability to express themselves in more than a few ways. Considering how many people are accessing Facebook from a mobile device, crafting long-winded comments and responses to posts may be impractical for some – preferring a quicker way to add depth to their response, maybe even with the intention of returning later for more interaction. The same can also be applied to other platforms, where there’s a handful of standard responses to posts that are still helpful in understand your reach, can be limited in terms of understanding what things resonated in particular ways for your fans or followers. Just like Twitter’s recent change from “Favourites” to “Likes”, it can offer clarity on what types of things your users and viewers are actually responding positively vs. the ones they’re effectively saving or bookmarking for later. Eventually, platforms like Facebook may implement the counting of different types of interactions in analytics – and you’ll be able to see the amounts of response types within the larger number of interactions. Not only might this help brands figure out which types of posts make the most impact, but which ones are eliciting very specific responses from followers. This is extremely helpful when you consider planning future posts because you’ll be able to take stock of the types of content that’s worked the best in the past – allowing you to reuse previous posts and content in updated ways considering it may have been something that was “Loved” or “Wow’d” more than it was simply Liked. As other platforms may make similar changes and rollouts that change the way users engage with content, brands should be prepared to take full advantage of the new wealth of information it would bring.